Whenever I'm feeling blue, or just when I want to add a little more sparkle to my look, I go for the gold. Gold products, that is! And you know what? I'm not alone! Brands like Chanel and Smashbox have created collections specifically around the gloriously royal hue. And what's better for the holidays than a little glisten under the mistletoe? Read on to find the products that will really have you glittering in golden glory. 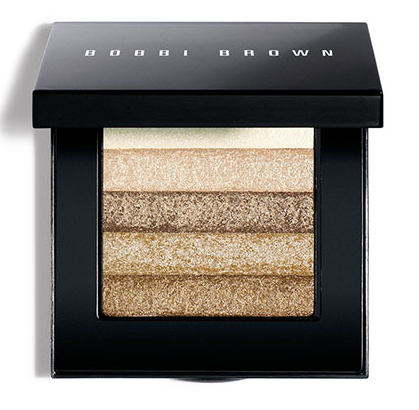 I am a huge fan of Bobbi's Shimmer Bricks. They're perfect as shadows, bronzers, blushes ... you name it, they add just the right amount of shimmer to your visage. And this one will make you so pretty and sparkly while you're standing next to the punch bowl at any party. I recently discovered the true appeal of blush and bronzer, and ever since I am totally hooked on anything that can bring my skin a bit more gleam. So is it any wonder that this bottle, which conveniently comes with its own little brush, is the latest on my list of fabulous buys? If the light shimmer, gold lacquer and unbelievable staying power aren't enough for you, maybe this will convince you. This polish was created with the one and only Cher! It's the one I reach for time and time again -- it just makes nails look like you "believe in life after love."